Wintergreen a member of the Ericaceae family and is found throughout eastern North America. Depending on locale, the herb is also known by a variety of alternate names such as checkerberry, teaberry, chinks, wax cluster, ivory plum and—for reasons unknown to us—drunkards. Wintergreen lends its fresh, minty flavor to tea blends, syrups, mouthwashes and candies. The oils in the plant, which were once used to soften leather for book binding, absorb and convert ultraviolet light into blue light that is visible to the naked eye. The next time you’re chewing on a wintergreen candy, turn out the lights and look in a mirror with your mouth open. Gaultheria procumbens a member of the Ericaceae family. Wintergreen is a small low-growing shrub, that typically reaching 10–15 centimeters (3.9–5.9 in) in height. The leaves have a distinctive wintergreen scent are evergreen; they are shaped elliptic to ovate, 2–5 cm long and 1–2 cm broad. Wintergreen's white flowers are bell-shaped, about 5 mm in length, and are borne solitary or in short racemes. 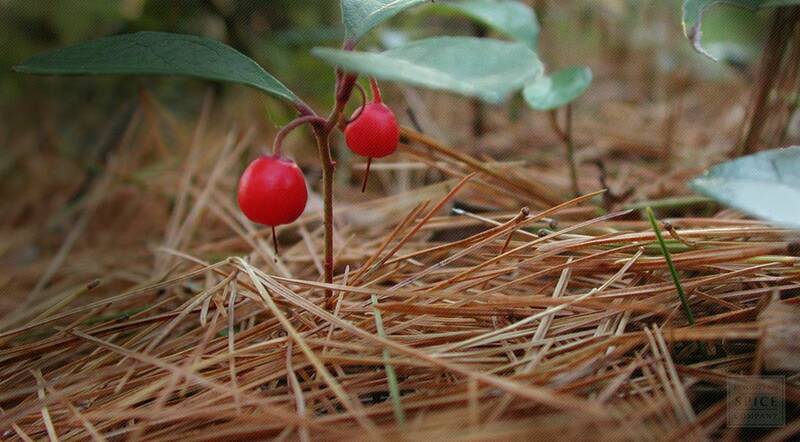 Wintergreen's berry-like fruit is in actuality a dry capsule surrounded by fleshy calyx. The fruit is red and is about 6–9 mm diameter. Wintergreen spreads by means of long rhizomes, which are run along the top 20–30 mm of soil. The plant's common name of wintergreen refers to the plant's ability to remain "green in winter", as suggested by the Dutch wintergroen, and German Wintergrün. Gaultheria procumbens is native to northeastern North America from Newfoundland west to southeastern Manitoba, and south to Alabama. Wintergreen grows in woods and clearings, especially beneath evergreen trees in full to part shade. Prefers a moist but not too wet humus rich soil. A peat and moisture loving species, it requires a lime-free soil. Once it is well established it succeeds in dry soils and tolerates considerable drought. Division can be carried out at almost any time of the year, but works best in the spring just before new growth begins. Larger clumps can be replanted direct into their permanent positions. Can also be grown from seed or cuttings. The leaves can be gathered at any time from spring to early autumn, they are dried for later use. Store dried wintergreen leaves in an airtight container in a cool, dry place. European settlers learned to use wintergreen from Native Americans, who made the herb into a tea, as well as to freshen breath. During the American Revolution, wintergreen tea was an alternative to imported tea, which was heavily taxed by the British. 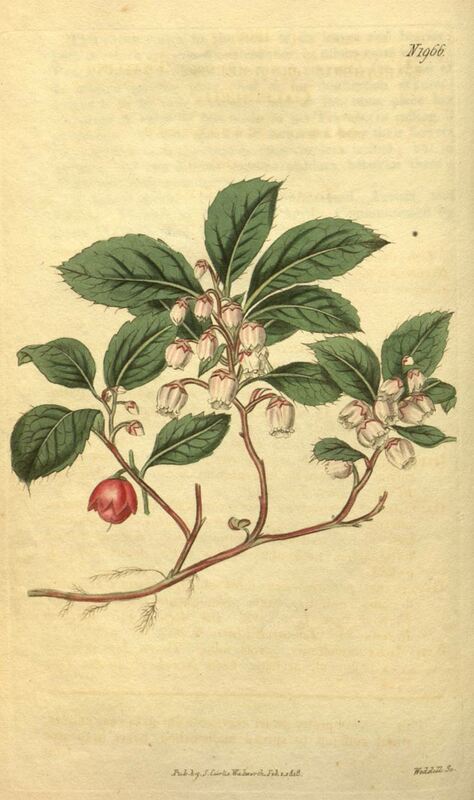 Wintergreen oil was used in cosmetics at one time, as well as bookbinding. The oil’s softening properties were used to make leather more pliable. The mint-like flavor of wintergreen was once featured in toothpaste, mouthwash, root beer and chewing gum, such as Clark's Teaberry chewing gum. However, the active ingredient has largely been replaced with a flavoring agent obtained from birch. Whole leaves and fruit, and the essential oil obtained from the leaves. The raw herb is prepared as tea. The essential oil is diluted and applied topically. The primary active ingredient is methyl salicylate, which has a rubefacient effect. May produce local allergic reactions on skin. Internal use of the essential oil is not recommended without the supervision of a qualified health care practitioner.